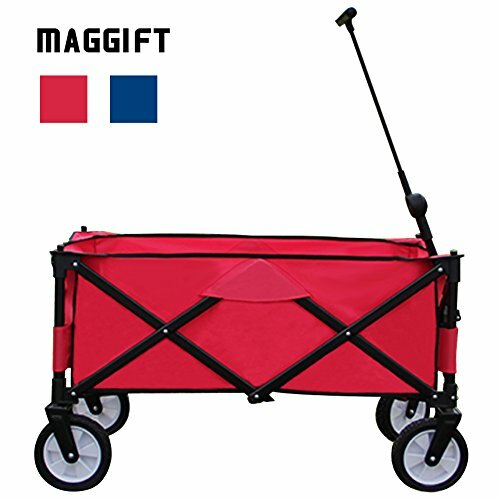 Maggift Folding Wagon Cart is a perfect utility wagon/cart for garden, beach and shopping. It is a must-have when you go camping, go to beach or garden, or just move things. 4 oversized large wheels, 360 position rotation of front wheels and fixed back wheels make this wagon more stable on most terrains. It opens and folds up in seconds, quick and easy. With a sturdy construction and durable 600D polyester, it supports up to 176lbs weight capacity - it's enough to take a large amount of daily items. It will not take up too much space as it can be folded up. Full Open Dimensions: 40.9" x19.7" x 21.7"
3. Use a damp cloth to clean. Do not use chemicals. For stubborn stains or extreme soiling, removal of fabric can make clean up easier. WARNING! Not to be used as children's ride wagon. CONVENIENT COMPACT STORAGE - Wagon folds to only 8" Thick! Folded size approx 30.3" x 12.2" x 7.9" and includes a convenient carry bag. LIGHTEN THE LOAD - The heavy duty frame allows loads up to 176lbs, durable 600D Fabric can be easily cleaned. FUNCTIONAL FEATURES - Front wheels rotate while back wheels are fixed, adjustable handle for effortless transport. EASY TRANSPORT - Perfect for hauling gear to the beach, outdoor sporting events, picnics in the park and around the house. Please note that it is not made to transport children.